The versatile RELAY-URM Series relay module can switch up to eight 15 A loads using low-level input signals from PLCs, process controllers, and indicators. Its flexible inputs will accept a wide variety of control signals. Selectable input allows activation of output relays on a direct-acting or reverseacting signal. Similarly, input signals can range from 5 to 24 Vdc. Conditioning of input allows open-collector or logic level inputs (e.g., TTL, CMOS) from PLCs or controllers to be used for switching output relays. 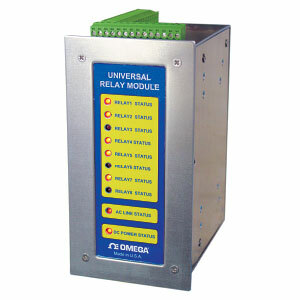 In addition to working with control/logic level signals, the RELAY-URM can activate output relays on contact closure. Many process-control instruments have low-power relays that provide contact closure for low-amperage switching but are not suitable for handling heavy loads. Simply connect the low-power relay contact output to the RELAY-URM unit and instantly get up to eight 15 A load switching relays. Input and output connections are made through Euro-style pluggable connectors, conveniently located on the top and bottom of the unit. Screw-in terminals allow for quick connect/disconnect of wires. The unit is housed in a versatile enclosure that can be mounted on a DIN rail or a wall. If desired, the same enclosure can be panel mounted, with relay and AC and DC supply status visible on the front. LEDs on the front panel turn on when a relay is energized. Both 4- and 8-relay module units come with a built-in universal power supply that operates on 100 to 240 Vac. This supply provides power to the internal electronics and relays and puts out up to 20 W (5 Vdc), available for external applications.